2018 has been an important year for social movements. We have seen ACORN tenants groups successfully stop housing evictions, Grenfell campaigners demanding justice and communities stopping new Fracking sites; health and education groups have stepped up their fight against the ever expanding hostile environment policy and cleaners at the Daily Mail won the Living Wage. On the 21st of July NEON will be coming together in the Rose Lipman Building in Hackney, London to celebrate these campaigns, discuss how we can work closer together & learn from each other and what strategies we need to achieve systemic change to our economy and society. The NEON Summer Gathering will be our biggest event of 2018 and it will be your chance to meet NEON members, organisers, activists and campaigners from across the country. In addition to workshops and plenaries, there will be networking, a big dinner (included in the ticket price!) and music & spoken word in the evening. Here is the full programme! The EF! Summer Gathering is a chance for people and groups from across the country and beyond to get together to network, share practical skills, ideas and inspiration to help our actions and campaigns be as strategic and effective as possible. This is an annual gathering for grassroots ecological direct action, this year focusing on welcoming people from impacted communities. The last couple of years’ gatherings have been the largest and most dynamic for many years, with over 100 workshops and more than 400 people attending over the five days of skill-sharing, networking and planning. 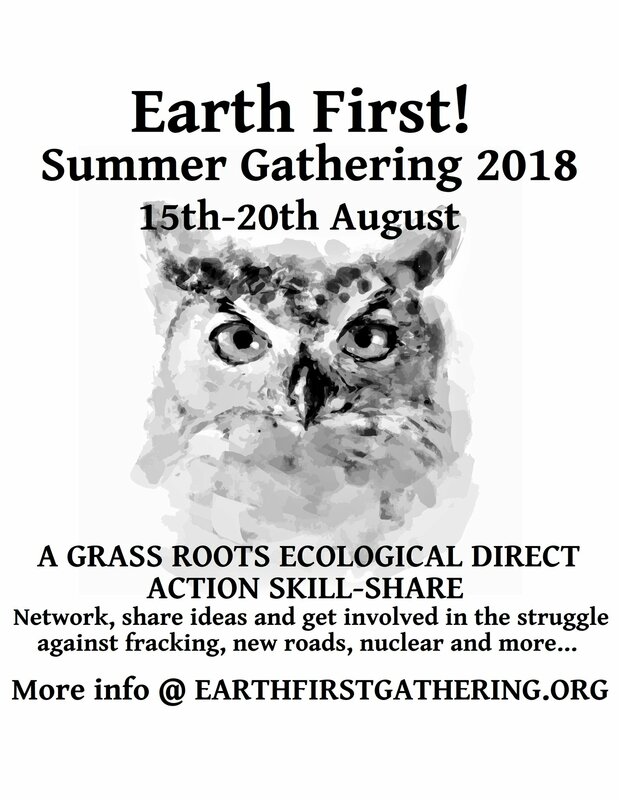 The gathering will be in Sussex this year, near Horsham, in solidarity with anti-fracking struggles in south-east England. More about the Gathering. More about Earth First!